Hi, sassy friends! Special thanks go out to all of our sassy and very faithful challenge friends!! Thanks so much for playing along with us in our challenges. We have a great challenge in store for you this week... wait 'til you see what it's all about. Number 2, who happens to be....Sue. Congratulations to you, Sue... Just email Sassy Cheryl to arrange for your $5 gift certificate. 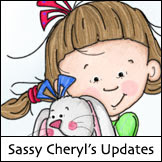 Sassy Cheryl will write back to you immediately so you can have your special prizes. It just couldn't be any easier than that! So, you can see we're in the pink!! Come and join us this week. Show us your pink! 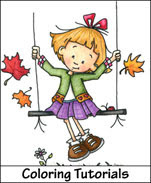 Just post your creation to your blog or online gallery using an image from SASSY CHERYL'S collection, then link up that post right here with Mr. Linky. We are looking forward to seeing your entry. 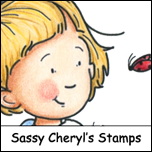 Each week Sassy Cheryl gives away a $5 gift certificate to her shop, and you just might be the lucky one! Fantastic as always! Loving the PINK theme that Jodi picked for this week. Going to be a great challenge! Congratulations Sue on winning the $5 GC! Jodi, I do love Pink and ladies these cards all have the WOW factor. Fabulous creations! These are adorable! 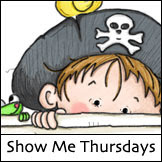 I came from Krafty Karens Blog, great idea for a challenge. Gorgeous work from the DT!! Love all the DT projects! I love all the DT cards! They are superb! Wow...all of these cards are so beautiful!!! I'm blown away this week! What a fun challenge...and I LOVE Pink!!!! This challenge was sooooo fun.....i love everything pink!! Thanks for the challenge, Jodi! I don't create with Pink very often. Lovely DT samples again this week!